On the 25th February 2011, a group of 15 statisticians (representing both the career young and the more career experienced) made their way to the RSS headquarters to take part in the first national YSS event of the year – “The Data Generation: A Statistical Literacy Workshop”. This one day event was designed to present ongoing efforts to promote statistical thinking and to improve statisticians’ comfort levels when presenting statistics to the general public. To begin, Julia Wilson from Sense About Science gave a presentation on ‘Standing up for Science’, providing an insight into their work responding to the misrepresentation of scientific information on important issues as well as their work with scientists to promote evidence in public discussion. In particular, Julia highlighted the Voice of Young Science programme which aids research scientists from all fields in the early stages of their career in getting actively involved in public debate about science. 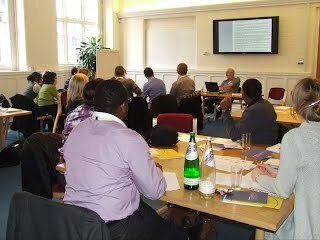 This was followed by an interactive session led by Debra Hurcomb representing the getstats 10 year statistical literacy campaign in which the audience was introduced to ‘stats pitching’ and ‘stats busking’ (discussed in a previous RSS eNews article: http://www.rssenews.org.uk/articles/20110301_2). Workshop attendees were split into groups to discuss how they would quickly highlight the importance and use of statistics if given only a minute in a lift, at a coffee machine or in a queue in which to promote the subject to someone who is not a statistician – the ‘stats pitch’. Discussions then ensued about how to actively demonstrate what statistics is all about through stats busking after a demonstration from Rebecca Hill of Science Brainwaves, a ‘science busker’ who has been taking part in busking at events such as the Green Man Festival. Volunteers were asked to pick up a jar of rice using only a pencil, an activity used to demonstrate the force of friction- a science busking idea. The attendees then had to devise interactive ways in which statistical ideas could be demonstrated. The attendees came up with ideas ranging from card tricks and the Monte Hall problem to a ‘beat the goalie’ type activity. Following a lunch of sausage and mash (vegetarian option available! ), David Spiegelhalter, Winton Professor of the Public Understanding of Risk, led a lively topical debate on the link between eating sausages and the risk of bowel cancer. Provided with a news release containing statistical information on the topic, the ‘pro-sausage’ group had to argue in favour of continued enjoyment of sausages and other processed meats whilst the ‘anti-sausage’ group relayed the dangers of this form of food. David Spiegelhalter then shared stories from his considerable experience in interacting with the public, the media and politicians. The final event of the day was a workshop on engaging with the media given by Andrew Garratt from the RSS. The workshop looked at how statistics are reported by the major newspapers and developed into stories. The fundamentals of drafting a news release were also explored in a very accessible and entertaining manner. The audience was then split into groups to draft their own news release (on the price and nutritional content of milk). To round off, attendees were invited to join the organisers and speakers for some well earned wine and nibbles.